Could this be the first domino to fall? 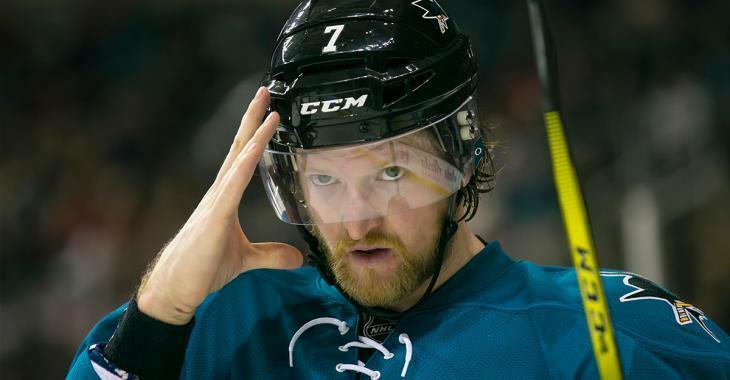 Earlier this weekend, Sportsnet analyst and NHL insider Elliotte Friedman reported that the San Jose Sharks are actively looking to trade veteran defenseman Paul Martin. The 36-year-old Martin has played sparingly this season due to injury, getting into just three games all season. The veteran blue liner recently played 4 games in the AHL with the team’s affiliate the San Jose Barracuda, picking up an assist during the stint. Martin is a veteran of 859 NHL games split between the Sharks, Pittsburgh Penguins and New Jersey Devils. Never much of an offensive contributor, Martin prefers to play a patient defensive game and has worked well alongside partner Brent Burns the past two seasons. With his recent injury history though and with younger players like Dylan DeMelo, Joakim Ryan and Tim Heed pushing Martin further and further down the team’s depth chat, something’s got to give. It’s unlikely that Martin would fetch much in a trade given his age and his contract which carries another year at $4.85 million, but the hope right now is just that he’ll be afforded the opportunity to continue his career elsewhere. “I do think San Jose is trying to find him another spot in the NHL, and there are people who believe he can still help someone,” said Friedman. Mercury News reporter and Sharks insider Curtis Pashelka reports that some teams are indeed interested and have inquired about acquiring Martin. As for Martin, he just wants to play. If that’s in San Jose, or elsewhere… it doesn’t matter. He just wants to play. You can hear it in Martin’s voice. He’s at a loss for words. He doesn’t know what his future holds… he just wants to play. He reiterated that his first choice is to play for the Sharks, but failing that just wants a chance to play elsewhere in the NHL. So, where would be a good fit? It’s no secret that the Toronto Maple Leafs could use a veteran defender or two. Or, how about the Chicago Blackhawks? They’ve missed the departed Niklas Hjalmarsson this season, could Martin be a short-term replacement? In other NHL trade news, Columbus Blue Jackets defenseman Jack Johnson has reportedly requested a trade. The Athletic’s Aaron Portzline broke the news on Friday, after it was revealed that the team has held off any contract talks with the pending UFA. Most in hockey know the awful story of how Johnson was taken advantage of by his parents, who squandered his money with poor investment. The 31-year-old has been forced to sue his parents in an attempt to regain control of finances, but he’s still reliant on another big money contract this summer to turn the ship around. The immediate frontrunners in a Johnson sign and trade appear to be the New York Islanders, Montreal Canadiens and the aforementioned Toronto Maple Leafs. Sit tight hockey fans, there could be some serious movement ahead of this year’s February 26th trade deadline.